I enjoy visiting gardens while on vacation, but you can visit many gardens from the comfort of home through books, web sites, and DVDs. This Christmas, the man in my life gave me a trip to the gardens of Jane Austen through a just-released book by Wisconsin writer Kim Wilson. I’m a minor Jane-ite (as Austen fans are called) and really enjoyed Wilson’s Tea with Jane Austen. In the Garden with Jane Austen takes readers to gardens that Austen and her family would have cared for — mostly cottage type gardens that mixed vegetables, flowers, and herbs — as well as the grander gardens she might have visited. 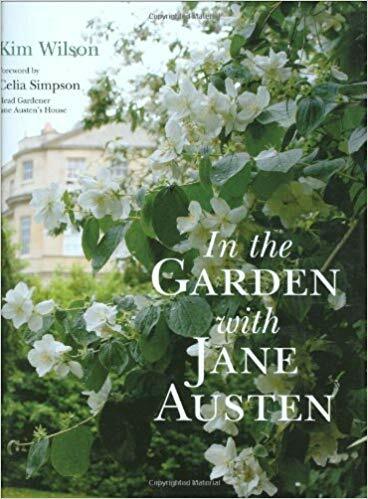 Wilson does a great job of connecting the gardens to Austen’s novels and letters as well as to the types of gardens that were popular in the Regency and Georgian periods in which Austen wrote. For instance, when Austen says in Pride and Prejudice that the drive around Mr. Darcy’s impressive park at Pemberley is 10 miles, she’s putting it in the same class as Blenheim Palace. Wilson also covers garden trends of the time that are mentioned in Austen’s books, from the need for “shrubberies,” graveled paths surrounded by trees and shrubs, to the fad of installing a hermitage, sometimes with a hermit in residence. It’s a wonderful blend of cultural and literary connections and garden history. Wilson has photos of most of the gardens and provides contact information for the sites that are open to visitors. She also has a list of the gardens filmed in the many movies of Jane Austen novels. If you were planning a real trip to England, this book would be an informative guide. Oh, I would like to have a hermit back in our woods! What’s required, do you know? To have a hermit, you need a rustic house and someone to live there. I’ve read somewhere that wealthy folk of Jane’s time would hire hermits and even ask them to dress oddly (in sack clothe, I think? and interact with their guests. Strange, eh?